Windows shortcuts are very useful operations in computing which invokes command to software. Apart from invoking commands to the computer software, it also makes tasks very easy and way much faster. Today's stroll, I would briefly state the list of new windows 10 keyboard shortcuts. 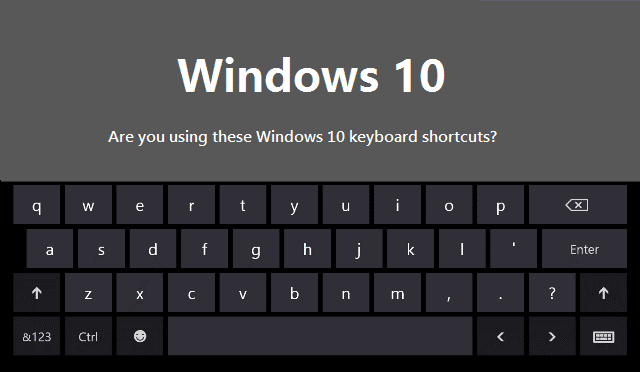 With time, the list provided would be updated, for now I was able to get information about the new shortcuts in windows 10. Win + (Left, Right, Up or Down) - For snapping of windows. The Up or Down is to get into quadrants. Alt + TAB (unchanged) - For Switching to recent windows. Holding the keys can also be used to display new task view, windows view and leaving the keys switches the app. WIN + Tab- for Opening task views and letting it stay open. WIN + CTRL + Left or Right- for switching virtual desktop. The above keyboard shortcuts are the few ones I was able to gather. With time, I would gather more shortcuts and keep you guys updated. Hope this brief tips helps.